With the outbreak of the Civil War the textile industry in New York, centered in the Broadway and Worth Street area, flourished with the increased demand for uniforms, blankets and other such military supplies, coupled with the wartime tariffs on foreign-made apparel. Henry Barclay had inherited his father’s substantial real estate holdings in Manhattan and Queens. In the 1840s the younger Barclay had constructed three five-story buildings at the southwest corner of Broadway at Worth Street. Now the potential profits to be made during this prosperous period prompted him to raze the relatively new buildings and replace them with grander structures which would command higher income. Begun in 1863 and completed a year later, the three five-story buildings were clad in gleaming white marble. Designed to appear as a single structure, they offered retail space on street level with manufacturing lofts and office space above. The Renaissance-inspired buildings stretched from No. 325 to No. 333 Broadway and Barclay’s conservative approach to architecture—expressed in his rebuff of cast iron—reflected itself in the overall, reserved design. The resulting structures were restrained, dignified and quietly elegant. Among the first tenants was the firm of Elliot C. Cowdin & Co., importers and dealers of “French fancy goods.” The company leased the entire fifth floor of No. 327. With most of the men away at war, young girls like Angelina Portlippi and Josephine Thompson filled the workspaces of shops. They pair made artificial flowers for Cowdin. On April 16, 1863 tragedy would visit the new building. In order to easily move goods vertically through the building, a shaft was constructed with sliding hatch covers on each floor. Goods in the basement or delivered to the ground floor could be hoisted up to the upper floors rather than being lugged up stairs. By the 1880s textile companies were giving way to stationery-related firms. In 1888 Pace Dennis & Co. was here, sellers of Howe Scales. The would remain through the turn of the century. Office work was being revolutionized around this time by the introduction of the typewriter. (Interestingly, the operators of the machines, later called secretaries, were also referred to as typewriters.) In 1899 Blickensderfer Manufacturing Company took over the entire building at No. 325. The company announced its move in The School Journal and noted that as well as selling its Blickensderfer typewriter, it was the sold agents for the Tucker Card Index System, Tucker Suspension Letter and Document Files, and the Wells Letter and Catalogue Files. 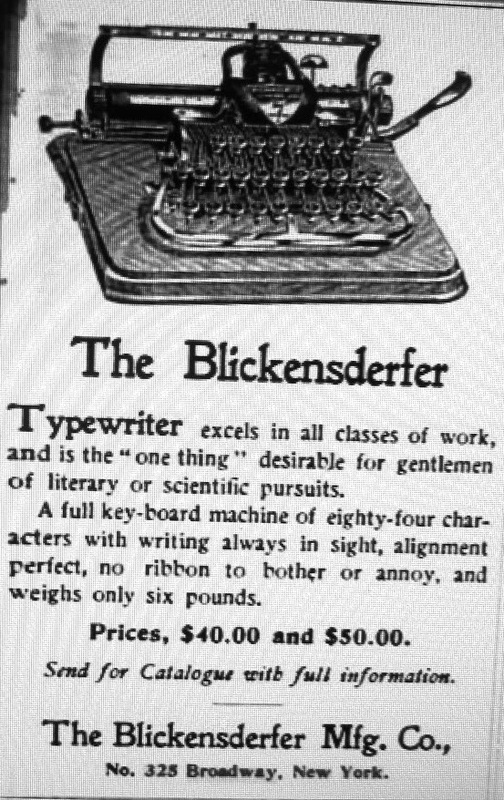 In 1900 a Blickensderfer machine was pricey -- about $1000 today. While Blickensderfer was promoting its new typewriters, Wickoff, Seamans & Benedict had been next door at No. 327 since around 1888 selling the highly-touted Remington typewriter. In 1892 King’s Handbook of New York spoke of the firm’s “executive offices and main selling headquarters” in the “plain and unpretentious, though substantial marble structure” at No. 327 Broadway. The firms were major competitors. Directly next to a Blickensderfer advertisement in Education Magazine in 1900 was one for Wickoff, Seamans & Benedict. “Solid merit is the foundation on which is built the enduring fame of the Remington,” said the ad. Wickoff, Seamans & Benedict would win out. In 1905 the company changed its name to the Remington Typewriter Company and about five years later leased the entire block of buildings from No. 325 through No. 333. Internal renovations were made, creating a single building. While Remington took nearly the entire structure, it still rented space to firms like the Smith-Premier Typewriter Co. (which would later become Smith-Corona). By 1917 Remington Typewriter Company had grown out of the space. That year it moved further north to No. 374 Broadway. With Remington’s removal, the building once again became home to, mostly, textile and dry goods firms (although in 1919 Keene Co. was here, exporters and importers of “chemicals and drugs, citric acid, tartaric acid, cream of tartar, Prussian blue, creosote carbonate, quinine, morphine, codeine, etc.”). Converse & Co., a dry goods commission agency moved in immediately and would stay for around two decades. M.C. D. Borden & Sons established its offices here, the selling agency for the American Printing Company—the largest cloth mill in the country. In 1923 Borden & Sons purchased the building. Throughout the 20th century the building continued to see textile firms, including Iselin-Jefferson Co and Dan River Mills, come and go. Ironically, considering the building’s history, throughout the 1960s the city’s Department of Labor leased rooms in No. 325 where unemployed minority workers could practice typing, thereby heightening their marketability. Today a variety of gritty shops inhabit the retail spaces, decorating the street level with flashy signs. Yet the Civil War period marble palazzo is remarkably intact. The original cast iron storefronts, somewhat altered, are still there along with the marble rusticated piers. Above little has changed in the century and a half that Henry Barclay’s building has stood.